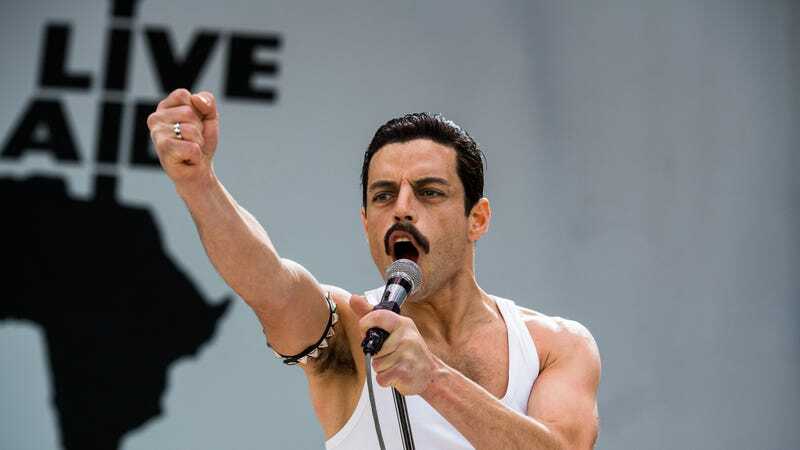 It took roughly eight years to come to fruition, but Queen biopic Bohemian Rhapsody hasn’t stopped rocking the box office since it hit theaters on November 2. It took Dumbledore and the goddamned Grinch to best it this weekend, though the film, currently in its third week, still came out ahead of new, buzzy flicks like Steve McQueen’s Widows and the soul-warming Instant Family by raking in $15 million. That brings its estimated domestic box office to nearly $128 million, according to Box Office Mojo, which also reveals that, when factoring in its international pull, the film has earned roughly $384 million worldwide. And it’s only going up. As such, Rolling Stone reports that the movie has officially become the second highest-grossing music biopic of all time, surpassing the 2005 Oscar-winning Johnny Cash biopic Walk The Line. As of now, it’s still trailing behind 2015's Straight Outta Compton, which made $161 million over its domestic theatrical run. This is impressive, what with the film having been plagued by a famously troubled production history, as well as middling reviews and ample controversy over the film’s handling of Mercury’s sexuality. There’s also the multiple sexual-assault lawsuits against director Bryan Singer, and the looming threat of an Esquire story allegedly detailing Singer’s history of sexual misconduct. Hey, at least Rami Malek’s good.